Count yourself as blessed if you’re lucky enough to have a Nana in your life! If you’re looking for special gifts for Nana, you’ll find a great selection here. Any of the personalized gifts on this page can be personalized with the name “Nana” (even though the pictures may show another title). A few of the gifts already say Nana on them, and a few of the gifts are just so special that I felt that they’d be delightful gifts for Nana, even though the gift doesn’t mention the word Nana at all. What grandmother doesn’t love to show off pictures of her grandchildren? 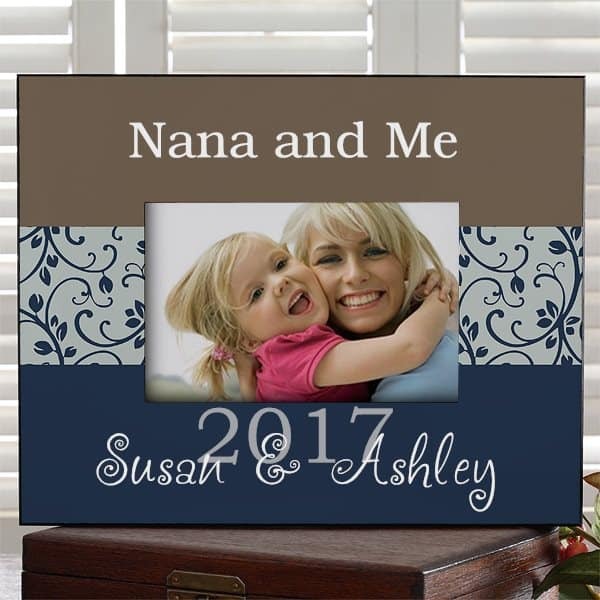 A picture frame with a fabulous picture of the grandkids is an affordable gift that will thrill her year-round. You can obviously use any type of frame, but I think the frames that have the title “Nana” in them are extra-special. The adorable frame pictured here is custom made with 3 lines of personalization in your choice of 4 lovely color schemes. Just add a favorite picture, and you've created a unique gift that Nana will love to display! A cheerful Nana mug is the perfect way to start her day off in style every morning when she drinks her coffee, tea, or hot chocolate from one of these delightful mugs. This makes a wonderful gift all by itself, or you could pair it with gourmet coffee, tea or hot chocolate. Have the kids bake a loaf of banana bread or make chocolate-covered coffee spoons for a fun touch. 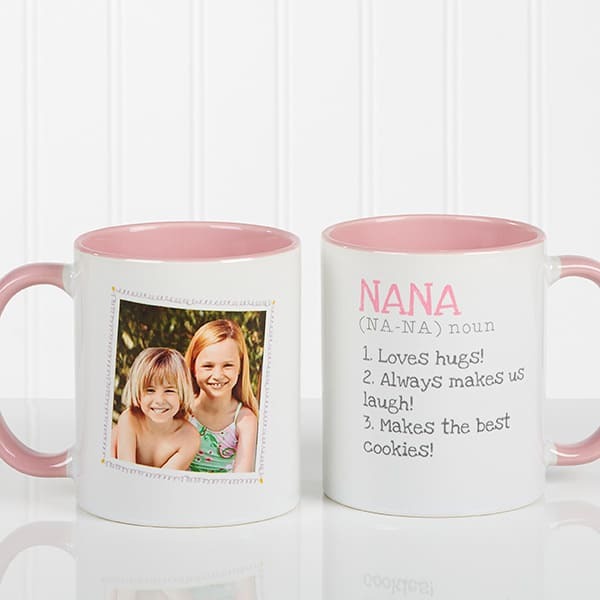 Consider getting Nana a coffee mug that's personalized with a unique message of love, or that features pictures of her grandchildren. Mugs are also easy for kids to decorate. Kaboose.com has a really easy tutorial for decorating a coffee mug using the kiddo’s fingerprints. I’m sure any Nana would love to wake up each morning to a cheerful mug like this! A Nana shirt is the perfect outfit for playing with the grandkids! Look for a personalized shirt that has the grandkids' names added to it for a special touch. 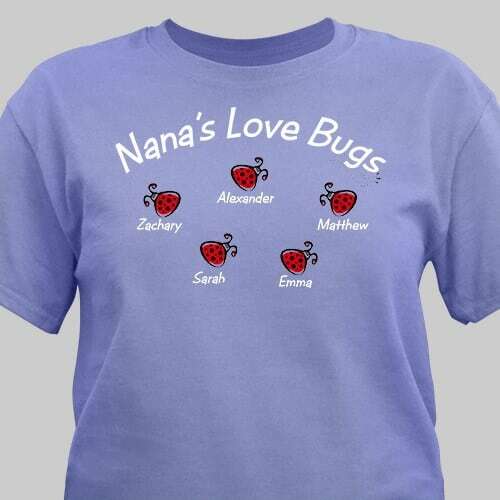 GiftsforYouNow has the best selection of personalized Nana shirts that can include grandkids' names (some shirts can even include up to 30 names)! A fun yet useful gift that Nana will love wearing! If your Nana enjoys wearing jewelry, consider getting her a necklace that shows off her pride and joy in her grandkids. The necklace featured here can be personalized with the name "Nana" and features shiny Swarovski crystal birthstone charms. You can order additional charms if needed - perfect for the grandmother whose family is still growing! Snuggling with Nana is the best! A cozy blanket that's personalized with the names of her loved ones will keep her warm and comfy throughout the year. 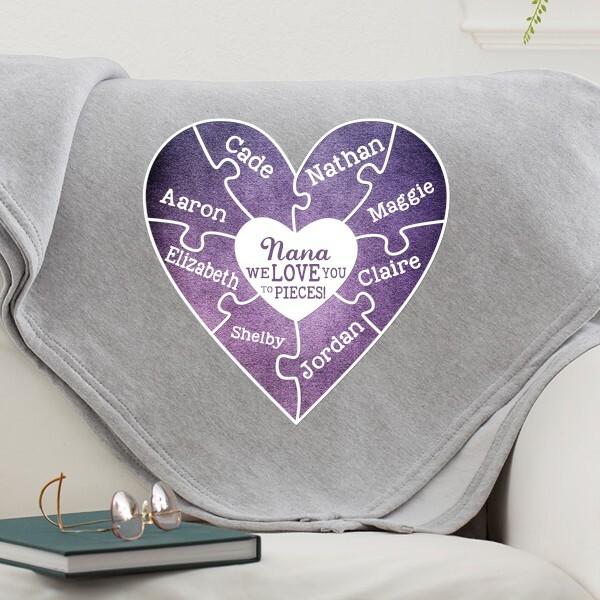 P﻿﻿ersonalization Mall has a delightful selection of blankets for Nana that can feature her grandchildren's names - you can even add photos to some of the blankets! If you're the crafty sort, a fun idea is to make a quilt for Nana with her family member's handprints on it. You can find some great tips on how to do this at Kristen Duke Photography. She swears that all you need to be able to do is to sew a straight line to make a quilt. Most grandmothers love to wear jewelry - why not give her a fabulous Nana bracelet? This trendy bangle style bracelet features her grandkids' birthstones. She can wear it alone or mix and match with other bracelets. A fabulous gift for Nana for any occasion! If you're looking for a sentimental gift for your Nana, consider getting her a figurine that will always remind her of your love. This sweet Nana figurine makes so many statements - it says "I Love You", it lets her know that you consider her to be an angel in your life, and it gives her a permanent bouquet of flowers - a lot to say in one gift! 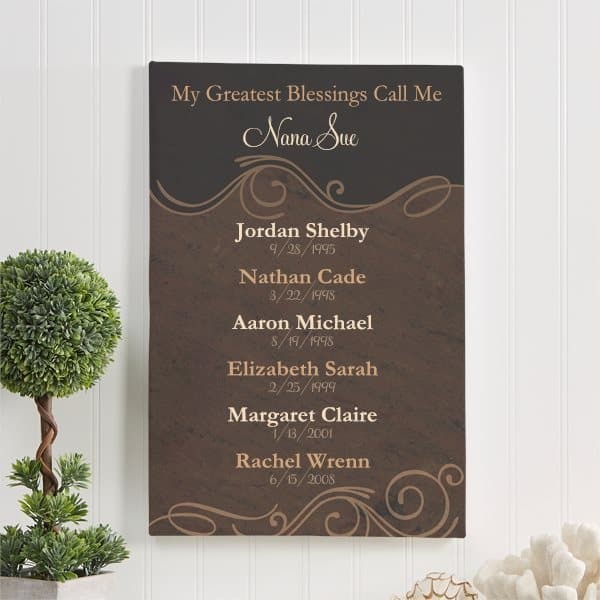 Treat Nana to a sign or plaque that reminds her of her beloved grandchildren! This lovely personalized sign will remind her of how blessed she is - and is a fabulous way to keep track of all those important birthdays. Nana will love reading how her grandkid describes her! 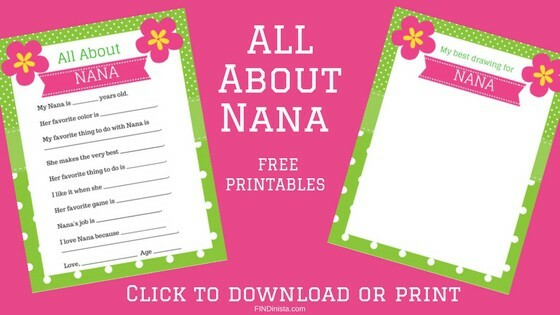 Just download these cute printables for your kid to create a cute little gift that Nana will treasure.